Sometimes on car trips, during a lull in conversation, I like to start up a game of “Who’s hotter?” At first, when I would ask Sean something like, “Okay, honey, who’s hotter: Alyson Hannigan or Cobie Smulders?” he was uncomfortable. I guess initially it didn’t seem like a good idea to talk about other people’s hotness with one’s wife. But now he’s used to it, and he joins in. He knows I won’t fly into a jealous rage. We discuss both men and women, to keep it fair. It’s all very fluffy and superficial – mostly based on appearance, though occasionally other aspects enter into it. Recently, while in the car with Skye and Auntie Beth, we had some really tough ones to decide on, and had to bring in nationality and extra talents (for example, Anne Hathaway vs. Rachel McAdams was almost impossible; Anne almost got it because she can sing, but then… Rachel’s Canadian, to the point that she eschews L.A., which is impressive and heartwarming to Canucks). Blah blah. 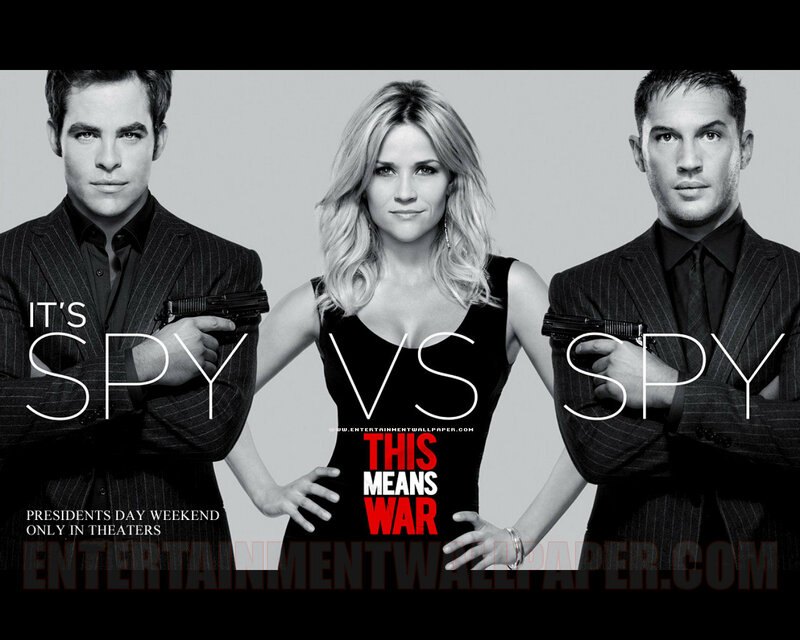 Point is, we went to see the movie This Means War for Skye’s birthday, and it’s a classic game of who’s hotter. I decided not to call this a movie review, because I think it (the post, or the film? let’s say both) might be just too silly for an actual review. Plus, if I were to “spoil” this movie (and I won’t), it wouldn’t make much difference to the viewing experience, trust me. It’s the tale of a love triangle between two best friends (and co-CIA-agents) and the one girl they each meet independently. I purposely did a little predicting to myself, about 15 minutes into the movie, just to see if I would be able to call the plot predictable. Guess what: I CAN. I was right about everything! Yay me. But I didn’t hate it. None of the three of us who went to see it (all female) hated it. It was reasonably chuckleable, and the writing wasn’t awful, and the starring actors are all good (and good-looking) and we all agreed it was fun. I’m not big on shooting and explosions myself, but I decided that the movie is actually a parody of spy films, seeing as all the action sequences were over-the-top ridiculous. The romance part, it must be acknowledged, is ridiculous too – terrible, in fact. But fun, if you’re not hoping to get anything real out of it. Apart from the love triangle, there were, as it turns out, a couple moments that sorta made me go “Aww.” So that’s always nice. But what’s my point here? Why write about this frivolous movie? Why, to ask Who’s hotter, of course! Who will our heroine pick? More importantly, who would YOU pick? And here are Reese and her gams (during the filming of this movie – in Vancouver! ), just for shiggles. Tom Hardy is clearly a Russian double agent. So – he’s the obvious choice. How many guys can pull that off? I agree – I’ve never been big on stubble. And Reese Witherspoon is pretty gorgeous. They make the most of her gams in this movie. While an accent is nice (and an extra point for Tom Hardy, plus he has starred in a movie with my boyfriend, Leo), in the end Chris Pine gets my vote for hotter! Oh Chris Pine all the way!!! Now that is a yummy looking guy!!! Chris Pine is fine, but not in THAT way, to me. I don’t go for the super-pretty-long-lash eye thing. And I know you go for a plentiful eyebrow, Di, but those are too much for me. But Reese Witherspoon, yeah. Those guys don’t really hold a candle to her. Now, Rachel Mac vs Annaway – Rachel for sure. Not just because she’s Canadian, and pretty versatile in spite of always maintaining unflawed gorgeousness, but also because Anne seems almost like a real person. If a real person were proportioned like a Disney heroine with gigantic eyes and smile. Which is why I was very suspicious of her at first. In spite of her Disneyness, she does gritty quite well. Incl. Jane Austen in the mud and that girl with Parkinson’s in that movie. And the tortured rehab sister. And she can sing, but she does it with this endearing slight awkwardness, not completely polished, which also makes her seem less Hollywood and more real. I would sort of like to be friends with Anne. But Rachel seems like the captain of the cheerleaders, who exists mainly for hotness purposes and is probably not to be trusted (unless you’re Ryan Gosling). And now I think I’ve used up my in spite ofs, so that’s all. I agree, Emi – Tom HANDS DOWN. 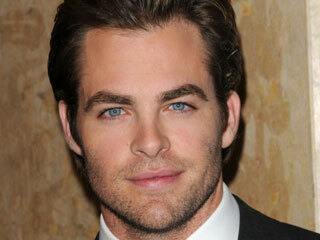 I thought you might peg me for Chris Pine because of the eyebrows, but somehow they don’t do it for me in his case. I think it’s maybe how pretty he is, as you mentioned. I dunno. But they were both fun to look at! And I enjoyed both of their styles, acting-wise. I don’t know who is who… (note to Di – the movie impaired need some captions please) but I will take them both! And in case that’s not allowed… the top guy is better looking but the bottom guy is sexier. And yes, Reese (I know which one she is!!) is probably the hottest. You’re absolutely right! I’ve added a new photo since she so richly deserves it. (And so do the Di-hards.) If I neglect the captions (sorry! ), you can always hover your cursor over a photo and the name will come up. GASP! Oops! Now I’ve fixed it. So silly, because I vote for Cobie every time. But the award must go to Tom Hardy. And this is because I very seldom ever notice the acting talent of eye candy, and yet I recently came out of “Tinker Tailor Soldier Spy” going: Who the heck was THAT guy? I thought he was fabulous as Ricki Tarr. (Second only to Simon McBurney, who is always fabulous, and has the best toast-buttering scene ever filmed in TTSS.) And talent, even occasionally wasted talent, is hawt. And NOW, I’m gonna have to see Tinker, Tailor, Soldier, Spy.